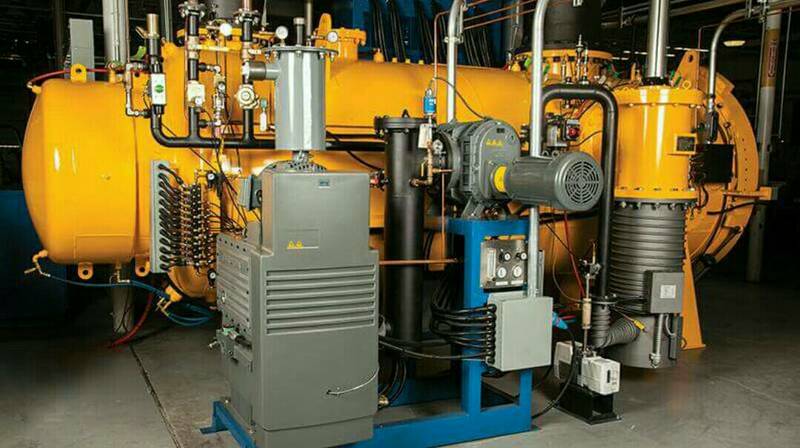 Vacuum pumping System : Vacuum Pumping systems are the most reliable and cost-effective means for producing high vacuum. The vacuum pumping systems are trolley mounted for easy movement and has capable of achieving an ultimate vacuum of10 -6 m.bar with Liquid nitrogen trap. DHVE offers many choices of vacuum pumping system, with different pumping speeds for various application, ranges from DHVE-65D, DHVE-75D, DHVE-114D, DHVE- 150D, DHVE-225F , DHVE300F and Custom built suitable for the most of the vacuum applications. The standard Vacuum Pumping Systems consists of DHVE Rotary Vacuum Pump, Diffusion pumps and other hardware like valves, baffles, collar, gauge and plumbing lines with Pirani Gauge to measure the roughing and backing vacuum & Penning gauge for measuring the high vacuum. etc. VACUUM IMPREGNATION SYSTEM , DHVE Vacuum impregnatiion system are used to impregnate electrical materials of transformers, coils and other items for good insulation. The growth of missile technology and space re-entry system is demanding new types of materials which will be light but hard . Resin impregnation is a well developed technology for developing such exotic materials . Digital Penning Gauge - DHVE Thisis a cold cathode Ionisation gauge consisting of two electrodes anode and cathode. A potential difference of about 2.2 KV is applied between anode and cathode through current limiting resistors. A magnetic field is introduced at right angles to the plane of the electrodes by a permanent magnet having nearly 800 gauss magnetic field which will increase the ionisation current. The electrons emitted from the cathode (gauge head body) of the gauge head are deflected by means of magnetic field applied at right angles to the plane of the electrodes and are made to take helical path before reaching the anode loop. Thus following very long path, the chance of collision with gas molecule is high even at low pressures. The secondary electrons produced by ionisation themselves perform similar oscillations and the rate of ionisation increases rapidly. Eventually, the electrons are captured by the anode and equilibrium is reached when the number of electrons produced per second by ionisation is the sum of positive ion current to the cathode and the electron current to the anode and is used to measure the pressure of the gas. This instrument with the sensor having wider range of applications, in high vacuum systems where the final Vacuum to be measured in process chamber. These instruments can be used in high vacuum systems, coating units, sputtering units, vacuum furnaces and many other applications where high vacuum to be measured in the range of 10-2 to 10-6 m.bar. Impegration Plant : The critical factor for any successful Impregnation plant is to ensure that customer's environment uses a process that provides an effective impregnation and a complete sealant solution all the time. At DHVE, we design Impregnation system that exactly fits the customer specifications. Our highly skilled engineers continuously leverage upon our rich industry experience and expertise to design, build and run impregnation systems successfully. Please call us to discuss your specific application and we will be happy to assist.